Kim Gottlieb-Walker is about to release the ultimate love letter to director John Carpenter, an intimate new book containing hundreds of rare photos captured by Gottlieb-Walker during her years as the director’s on set photographer, giving Carpenter fans an amazing look at what it was like to be there when The Shape first appeared on screen or when Plissken first hissed the line “Call me Snake”. After making her name as an underground counterculture photographer in the late 1960s and following Bob Marley around for a few years in the ’70s, Kim Gottlieb-Walker was hired as the official production photographer of John Carpenter’s Halloween in 1978, and she would remain on Carpenter’s crew through many of the most popular films that followed, including The Fog, Escape from New York, and Christine, as well as Halloween II. Her new book, On Set with John Carpenter, is a perfect collector’s item for fans of the writer/director/composer, but it is also a time capsule transporting readers back to an era before the digital age of cell phone cameras and internet gossip blogs hungry for spoilery content from the sets of Hollywood productions, a time that today’s teen moviegoers have absolutely no memory of. 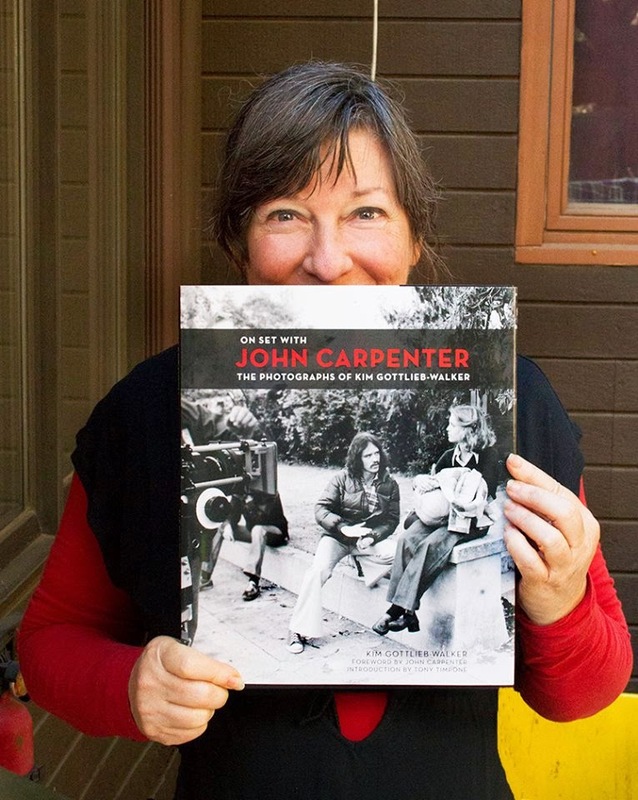 We caught up with Kim earlier this month to discuss her own favorite memories of Carpenter, what it was like to witness the master at work, and what treats readers will find in her beautiful new book. Read on for our full interview with photographer Kim Gottlieb-Walker! Do you see Jamie very often? Why is this book coming out now? “ Mainly because I’ve reached the point in my life where I’ve retired, and I’ve been looking back over my past history and deciding what I want to do with my retirement. About four years ago I did book on Bob Marley, from the years I had worked (with him) from ’75 and ’76, and it occurred to me that I have all these wonderful pictures from the films I had worked on with John. I talked to my publisher and they said, ‘Well let’s see what you have in mind’. So I uploaded a few hundred pictures, and they said, ‘Oh yes, that’s a good idea. Let’s do that’. “John was on board with it, (Halloween producer) Malek Akkad was on board with it, so I put it together. I printed up pictures from the various films and met with people who had participated in them, most of whom have gone on to wonderful careers. “So many people who started off as production assistants are now major producers, like Jeff Chernov, who just produced the recent Star Trek movies. He was a production assistant on Escape from New York. It was really fun, I got to go into his office, where they were just wrapping from having finished shooting, with a stack of pictures showing him as a production assistant that all of his production assistants could see. They all just got such a kick out of it. It was so much fun. “It’s predominantly photos, but every page has memories from different people who participated. It’s really a labor of love. The book is very much a love letter to John and Debra (Hill), because so many people got their start with them. How did you first hook up with John and Debra? “The way it started was, I had been an underground photographer in the late ‘60s and early ‘70s, and had put together a portfolio of people like Jimi Hendrix and Andy Warhol. It was a pretty extensive portfolio. At one point, Robert Mitchum’s daughter Trina was living next to us. She was photographer and she had been asked to shoot stills on this little low budget movie, and she wasn’t going to be in town, so she asked the producer of it to look at my portfolio, and he hired me to shoot the movie. “It was terrible movie. I don’t think it was even ever released, but the script supervisor on the movie was Debra Hill. That’s when I met Debra, and she really appreciated my photos. 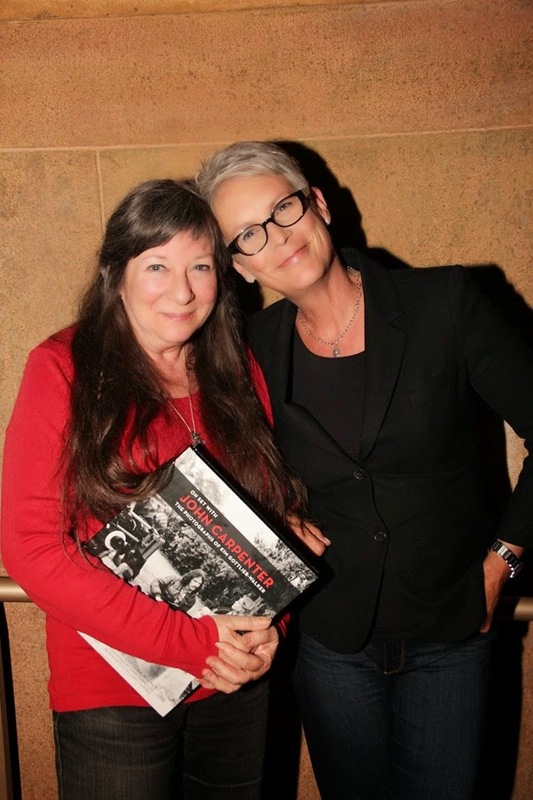 She loved my photos, and when she wrote Halloween with John and was producing it, she thought back to all the people she worked with as a script supervisor and gathered together the crew that way. That included (director of photography) Dean Cundey and (camera operator) Ray Stella, and it included me. 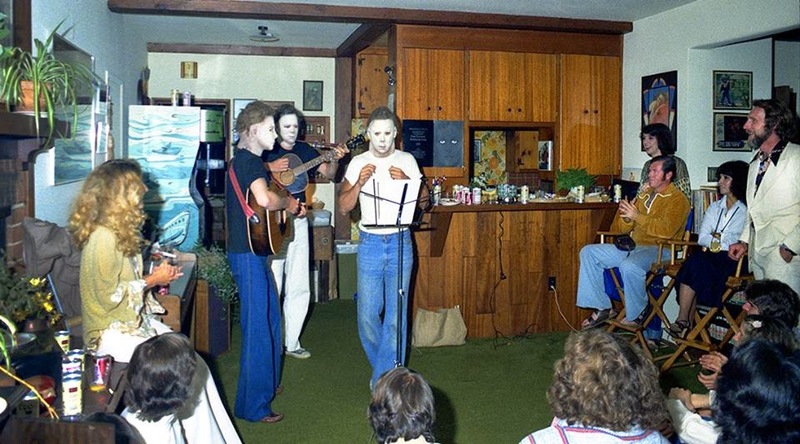 What was it like on the set of Halloween? “It was so much fun. It was unbelievably fun. John knew exactly what he needed and he knew exactly how to communicate that with the crew. It was very efficient. You have to understand it was shot in something like 22 days for $300,000, so it was very efficient, but it was just lovely. Everyone appreciated everyone else, and John especially, he loved his crew. He appreciated everything that each one of us could bring to the project. “In those days I didn’t even have soundproof blimps for my cameras, so when we were doing the sound take where there’s dialogue, I couldn’t really shoot, because they’d hear the click, so when the scene was over, John would say, ‘Okay, now do it again for Kim’. You’ll never find a director that will do that. “It was just wonderful for me, and it gave me chance to direct a little bit. When Annie is killed inside the car, that’s shot through the window of the car, so there’s no way to really get a picture of that unless you’re the movie camera. So when they finished shooting the scene, John had them pull the movie camera out of the window of the car and he said, ‘Now let Kim get in there and do it again for Kim’, and he let me direct them so I could get the right angle of the knife blade and of her head, so I got to get the exact still that we needed from that scene. “They’re not frames pulled from the movie, they’re stills on their own. It’s so wonderful that John understood the value of the stills and how they would help promote the film and get the word out. His sense of being willing to preserve the history of the shoot just made it wonderful for me. Did you know Halloween was going to be something special? So you were part of that team from the point on? “It was very much like a family. When we’d get for the next film it would be like a reunion to see all the crew members again and to work together again. It’s a wonderful way to work, because everybody helps everyone else. It can be very difficult for a still photographer if they don’t get along with every member of the crew, because they could be walking through your shot with a mic stand or not being able to give you an apple box if you need to get higher, but when you’re working with a family crew like that where you all really enjoy each other’s company, you all help each other and it makes it easier on everyone. What memories do you have that most people don’t know about? “Well John was a great practical joker. There were always little games going on when we were on the set. ‘Richard Kobritz would drive his Porche to set everyday and put a car cover over his beautiful baby. At lunch one afternoon, all of the cast and crew were all told to come out and watch what was about to take place. Little did Kobritz know that Carpenter replaced the Porche with a beat up Volkswagon bug, but had the same car cover placed over it. While the cast and crew were eating, we watched a huge yellow bulldozer being moved from one place to another. “Well the bulldozer detoured and rolled right over the VW. To this day I break out with laughter when I think about how Kobritz thought his Porche had been turned into a pancake.’ That was story from Malcom Danare, who was in Christine. “I got all kinds of wonderful little things like that from different people. “In Halloween II, remember the gag when the doctor is discovered with a hyperdermic needle sticking out of his eye? Did you see the movie Argo? So the fellow played by John Goodman, named John Chambers, was a special effects person and we didn’t know he was involved with the CIA when he did the special effects for Halloween II. I found that out when we did the interviews for the book. We had no idea, because it was classified until recently. “On Escape from New York, we turned the Sepulveda Basin in L.A. into Central Park, and the way we did that was, James Cameron was an assistant effects guy, and he painted a skyline in New York on glass and then lined it up with the horizon at the Sepulveda Damn and it turned it into Central Park. The only thing we didn’t realize was that when the helicopters fly in to drop the care packages, that they would fall behind the skyline. 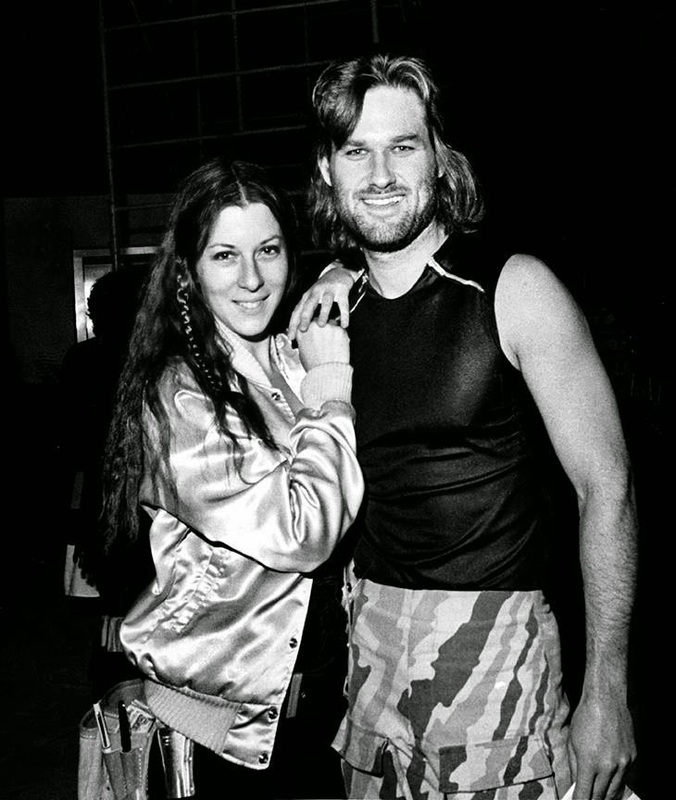 What was Carpenter like on set? What other technical challenges did you encounter on these sets? “He would always shoot at very low light levels. At the time there weren’t a lot of film stocks that a still photographer could use that could accommodate those low levels. That’s one of the reasons most of it is in black and white, because I could shoot Tri-X and push it to 1200 or 2400 and be able to get what the movie camera was getting, but there weren’t a lot of color films that were able to. The best you could do would be Ektachrome, which the ASA was 160, which is nothing. You could push it one stop, so it could go to an ASA of 320, which is still nothing when you’re working at like six footcandles, which is almost no light at all. “So I got to be very good a shooting at very low light levels. Sometimes it meant shooting at a 30thof a second at f2, not breathing and hoping it would turn out. There were a lot of instances where I couldn’t even take a light reading at all. “There’s a shot of Donald Pleasance from Escape from New York where he’s firing a machine gun from up on the bridge, and it was at night and all the light comes from the firing of the machine gun, so there was no way to take a light reading, and it was also quite far away. So all I could do was make my best guess at what it would be once he started shooting and hope for the best, and then two days later when I’d see the proof sheets, I’d see if they turned out. And it’s one of my favorite shots, because the whole thing is illuminated by the machine gun. You can even the shells flying off behind him. “We didn’t have a lot of money, so I had to make every single shot count. “I see people today with digital cameras and they’ll shoot a hundred frames of the same thing hoping something will look good and they look at it right away, but with me, I’d have to wait for the shot I wanted, shoot that shot, and then wait a couple days to see if I got it. Do you have a favorite John Carpenter movie? “Well there are two books that I’m thinking of doing. You know, I worked on Cheers for nine years, and so I’m thinking of doing a book with Cherie Steinkellner, who was one of the writers and producers on Cheers, because she knows all of the writers and they all have stories to tell that have never been told. I have lots of behind the scenes pictures from the nine years that I worked on Cheers. I was kind of the family photographer for Cheers. So that will be a fun book to put together. “And then also there’s all the stuff that I did when I was working for the underground press and for the music magazine where I met my husband. I think that book will be called My ‘60s, and it will go from 1967 to 1974, because that’s what I consider my ‘60s. It covers all of the rock and roll, popular culture figures, political figures that I photographed during that time period. “And also I’ve written a romance novel, so I’m querying agents at the moment to see I’m going to publish that. “It was something that actually wrote about 10 years ago when my memory was still good, and it’s about a counterculture young photographer and her travels around the world and her adventures. I took it out recently to see if it was embarrassing or a fun read, and it turned out it was really fun to read. I joined a writer’s critique group and they worked with me and made it a hundred percent better, and it’s ready to publish now, so I’m looking into it. Do you ever get invited onto sets today? “I represent still photographers on the national executive board of the Cinematographers Guild, so photographers will let me know when they’re having problems on the set and I bring it to the executive board and see if we can work out solutions. “The advent of digital cameras has actually been a tremendous problem, because everyone has a cell phone that can take pictures, and it’s kind of destroyed the security of the set. The producer no longer has control over the images that are released. It makes it very difficult for the still photographers to get what they need, because the actors get so tired of everyone taking pictures of them that when it’s time for the pictures that are the actual real pictures for the production, their patience is gone and they don’t understand why any more pictures need to be taken. It kind of undermines the role of the still photographer on the set, so we’re dealing with all kinds of things. “A lot of producers expect people shooting digitally to do the equivalent of all the laboratory work after we’ve wrapped as well, and sometimes a day can go 16 hours, and then were supposed to do another two or three hours off the clock of what the lab should be doing with the pictures, which is a terrible precedent. So we’re dealing with all kinds of consequences of the digital revolution. “We’re still just as important, but there are so many people who whip out their cell phones and upload things right away to the internet that it makes it very difficult to shake the image of the film, to release things the way the producers would like to see it released. It’s just made it a whole new ballgame. Are you still shooting today? 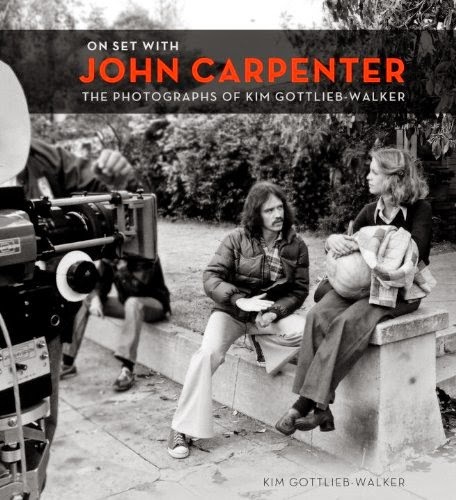 On Set with John Carpenter arrives this Tuesday, October 21. You can order yours here.